The site enjoys a sea front and is located on the main road connecting the airport with the city of Nouakchott. The program includes Commercial, Residential, Boutique Hotels and Resorts. 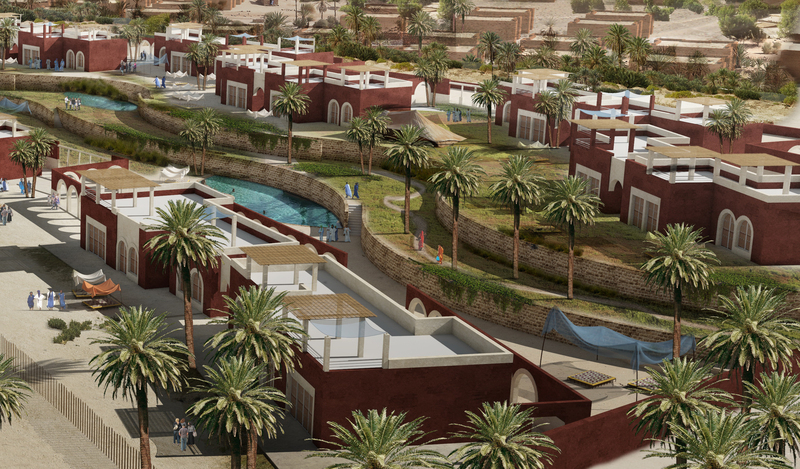 The Masterplan’s main feature is the Central east - west Linear Souk- commercial spine. It a sort of Bazar- Boulevard space that starts with a Plaza and gradually opens up to the wide sea view at the western end. The souk is an experience of discovery and is designed with a spirit of traditional markets of the area. The local architecture of Mauritania was the inspiration to develop the vocabulary and the visual aesthetics of our project. This can be seen in the scale, colors, textures and facades and other architectural elements that were used in the design. Landscaped areas are an integral part of this masterplan. The Residential Neighborhoods each has its public garden and a Linear Green path connects all Neighborhoods and other project zones together and also connecting pedestrians to the sea shore.